I purchased your jig and LOVE it. I had never done bead crochet and and i was actually successful with my first one i tried. I do have a question though. On one site i noticed you had a CD that was available that also included showing how to do a 6 bead round with your jig. Is that available for purchase separately? 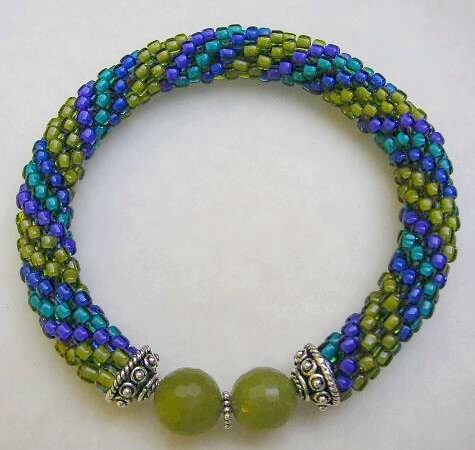 Also i am using s lon cord with size 8 seed beads and the hook you included in your kit. My thread is showing a lot. Is it suppose to? I tried using jeanstitch and i had a lot more trouble because the tube was so flimsy so i really rather work with the thicker cord. Any suggestions? I’m so glad you like the jig – I’m always happy to hear back from customers! I looked for your invoice to send you the 6-bead around PDF, and could not find it (you probably used a different email associated w/Etsy). If you send me a convo thru Etsy, I’ll be happy to email you the file at no cost. As for thread… I use the same thread for size 6’s and 8’s – it is C-Lon Standard Bead Cord found on this page: http://www.store.jewelsinfiber.com/nylon.html . I’ve also used a slightly thinner cord by C-lon for 8’s – it makes the rope a little less tight, and the thread is less visible – it is called C-Lon Fine Weight Bead Cord (also called C-Lon Tex 135) found here: http://www.store.jewelsinfiber.com/nylonclc135.html . The Standard weight is .5mm, and the Fine weight is .4mm -it doesn’t sound like much difference, but it is!! Good luck – hope this helps! I have a knitting spool that resembles your jig. Is it possible to just purchase the instructions without the jig? 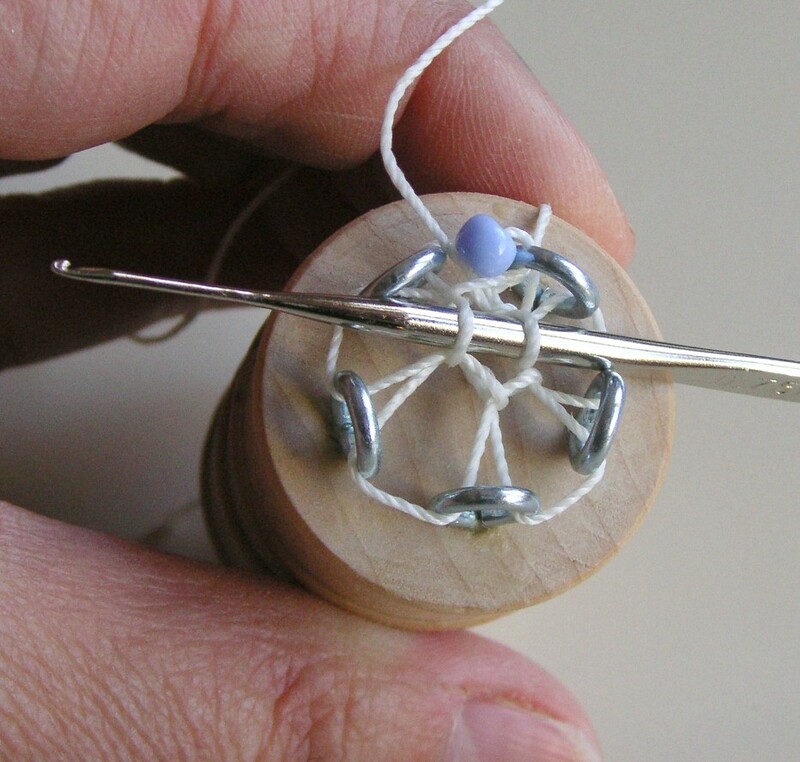 Hi Sharon – the knitting spool you have is probably not usable for bead crochet – the jig has loops (not pins) that the crochet hook actually has to fit thru. I checked every knitting spool kinda kit available, and they are not workable (I’ve got a patent pending on my jig, so I checked out all similar items). I do not sell the tutorial without the jig – I’ve had some instances where folks thought they could make the jig… I used to teach classes with this jig, and at one time, I had my students fabricate the jig – never again!! Sharon – I know it’s been a while, but I wanted to let you know that I now sell a DIY tutorial – it has directions for making a jig (two styles, depending on your fabrication skills), as well as the full tutorial. This may be of interest to you – it is downloadable files only…. Thanks so much… glad you find the jig helpful! Hello, I’d been crocheting bracelets for a while and loved the results but had the same problem you did. I would purchase a jig, but here’s my other problem: I have so much trouble finishing it off! Going back and forth between the two ends, I completely lose my place. Any suggestions? (I’ve since switched to kumihimo — but you need a clasp with those, which changes the design. Lynn… I always have a problem with the continuous rope and the “seamless” connection (never looked seamless, no matter what I did! 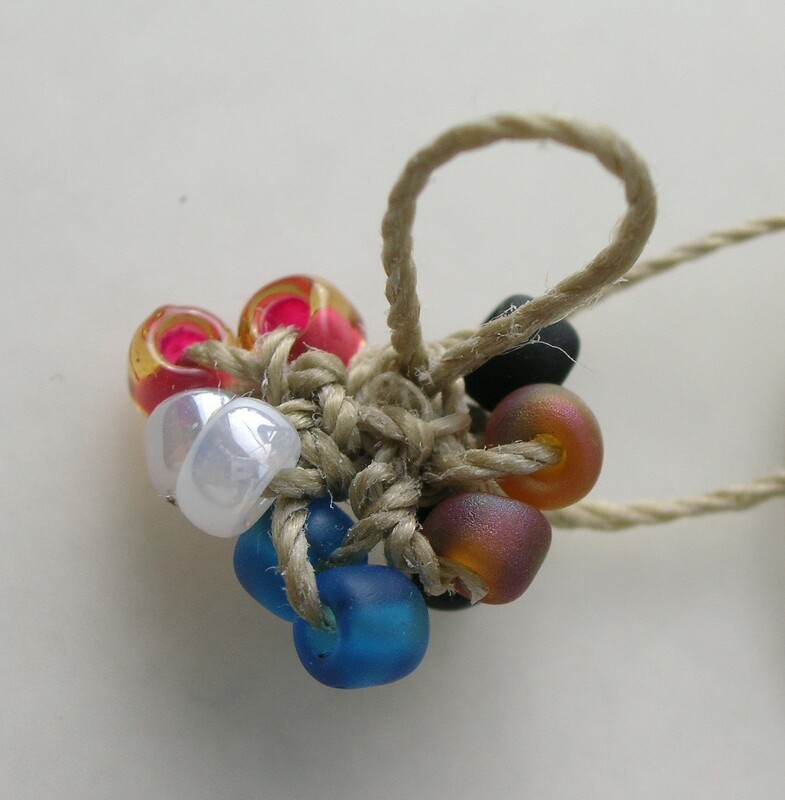 ), so I just add end caps on the rope, and usually put a bead between them. 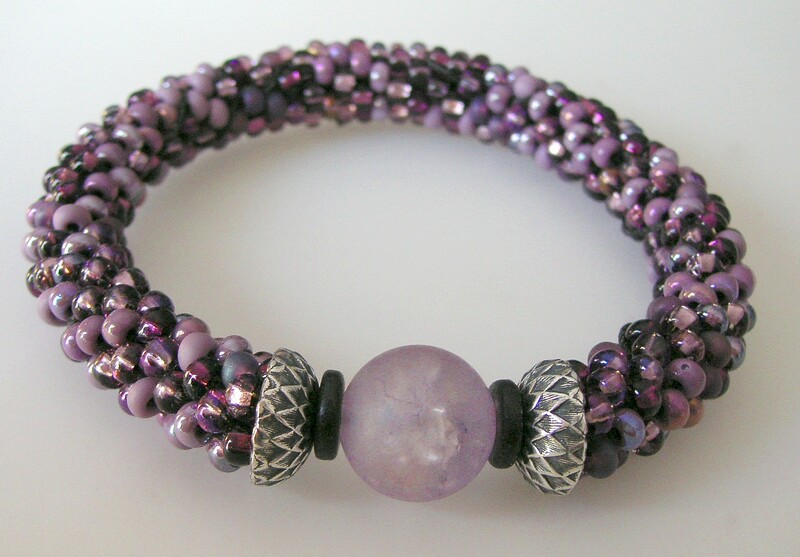 It makes a nice focal design, and doesn’t require any bead matching. I provide complete directions for ending the rope with this technique in the tutorial that comes with the jig, but here are the basics: just end the rope with a slip stitch all the way around, so the beads are secure, and slide an end cap over each end (you should make sure to leave a “tail” of about 8″ at the side you started). Then you need to use a needle (make sure it has a blunt end, like a tapestry needle), and thread each side back up thru the other side… you can put a bead with a larger hole in between the bead caps if you want. You can also use this technique with the kumi if you like… Good luck! It works! Even a man can use it! Seriously though, it certainly made the mysteries of starting bead crochet much more understandable! Thank you! I’m glad it works for you… my goal was to create a genderless jig and tutorial!!! Can you use the jig for using different number of beads per row or always the same amount? 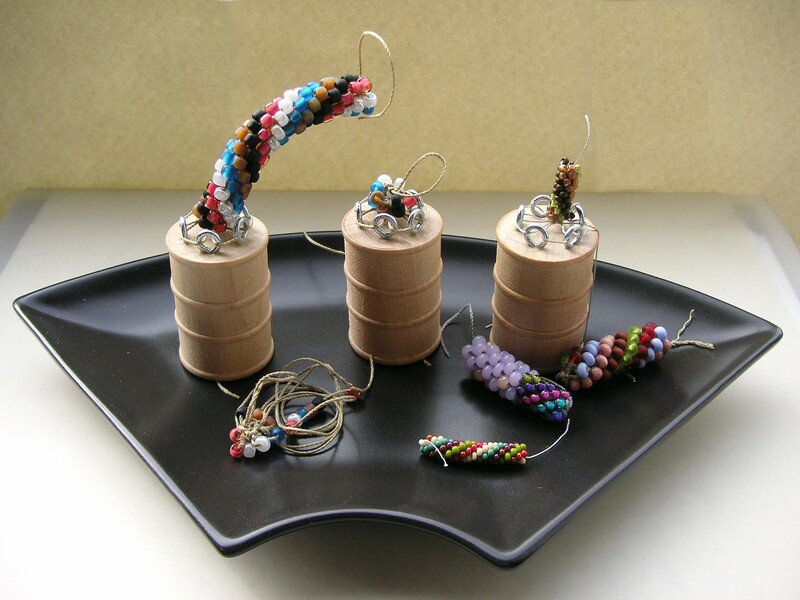 Hi Ana – the basic jig that I sell works for 5 or 6 beads around… I also sell another jig with 7 loops that can work for 7 or 8 beads around (this is a special request jig). Also, I sell a downl only tutorial, showing how to make both the wooden jig (like the one I sell), and a wire jig – the wire jig can be made with more loops, to accomodate larger jigs. Both the wooden jig, and the tutorial, include full instructions on use. 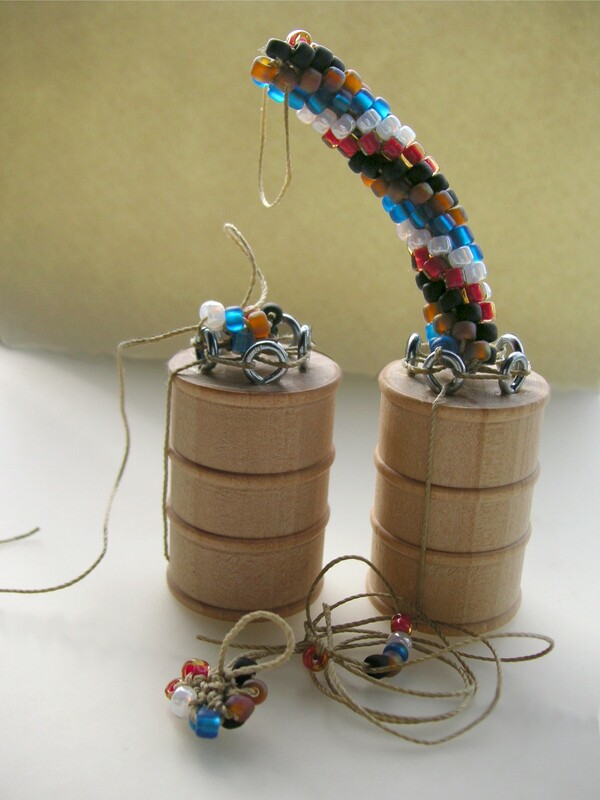 If you are interested in making ropes with more beads around, the tutorial may be a better option for you. Beautiful ! I didn’t look to see if the author’s Etsy store still has these but I wanted to share the beautiful handiwork! Yes… I still handmake each jig by hand, and still sell them at my Etsy store. Thanks so much! Here’s the thing….I can usually get a bead crochet rope started….but I can’t end them seamlessly….I can see how to do it when someone demonstrates, and I get how you’re supposed to go back and forth between the two ends to draw them together. But I can never do it when I get to the end. I’ve been doing kumihimo instead but that requires clasps. Anybody got any tips/ideas for learning how to finish properly? Thank you for sharing this process. This is my newest interest, and am anxious to try my hand at it! Just wanted to let you know I got my jig when you first made them for sale and it is one of the more helpful tools in my kit. I don’t make bead ropes constantly so I would have to relearn the beginning every time before and now with the tool It is easy to get one started even if it has been a long time since I’ve made one. Great idea, thanks so much. I purchased your jig and have the cd, but am wondering if you will ever make a video? Hi Debra, thanks so much for commenting… I’ve thought about making a video, but hosting a secure video is just a bit too pricey for me to consider now. My plan in the future is to create a short video to include on the CD. I tried to create clear directions with many photos, which most people find to be enough, but I understand – watching a video is how I prefer learning too!